Autumn Leaves In Summer: fiesta... oops! remember the only games i played are confined to non-electronic ie. board games? no arcade, no mmorpg, no nintendo wii. not a bad life you know. yeah, wth with "no life." i can live with it. each at separate times, i had unintentionally dug up a few (no more than three so far) cases of death with similarities. these "victims of their own" spent three days and three nights doing nothing but stay (in this era, obviously online) on their computers. and they all died on the third day. @_@ addiction is bad, people. dont die. (you're giving a bad name to people alike.) though, one of them did get a mmo funeral in the game itself (!) and a mention in a guinness tome. still, dont die! what with the cheong hei beat-around-the-bush thing im doing here? point is, i dont do mmorpg (more often than not, its coz i dont have the internet to do so). i recently tried fiesta online but.. yes, it was fun and all, but when i COULD NOT pry myself away from it, you know what it means. no, im not dieing three days later! sheesh. at least, i knew what it means. i lost a lot of organisation and it was like ashley olsen (the fictionised book character who is very organised - i am not, but in a way, so i mentioned her) losing her life - when her organiser/daily planner went missing. i lost control over how much time to divide where and which should get more attention. 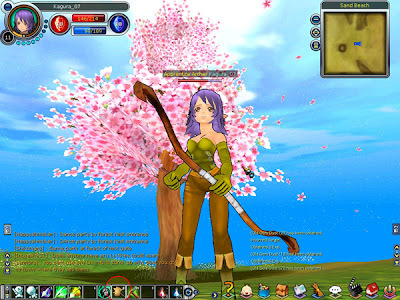 mmorpg is a baaaad thing for me, people - others may fall for drugs or clubbing or what-nots but mine's mmorpg. i keep wanting more, its totally an unbalanced affair. ACG events, i attend only for the A and the C, dont involve me in the G.
oh, dont get me wrong. im not one of the members of PEOPLE-AGAINST-ONLINE-GAMES ORG. but i am against my own judgement to take up this new hobby. no more fiesta online for me. at least, not until i have the time. nope, not even next semester break (february 2008) coz i gotta start and finish all my sewing projects. buying cloth and materials this year, saving for the next coz the prices are going up. 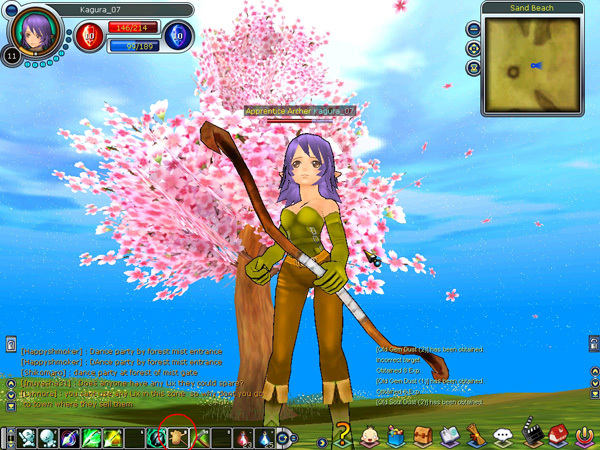 anyway, here's a screenshot of my avatar in front of a full bloom sakura tree. (i dont hope to find out for you that it stays full bloom every season or not.) im an archer who has gotten herself a horsie to get around coz archers has got to be the slowest moving of the four types. and to think their only up point is being able to attack from a distance. 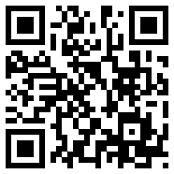 fiesta online, outspark. the end. (for now.) otherwise you can call it my secret activity when im online at home. i had to kill off wolves and such to get that shot you know. that place is infested with them. and then i had to find an angle where no alive wolves or players are visible. i play for aethetics indeed. hmm... now i knw why u were hanging on for so long..
but hey.. u lvled twice as fast as i did..
i've stopped it for the mo too..
medic> i dont say i blame anyone. but if i do, i'd blame you for letting me enjoy gaming on fiesta. hey, everyone goes through some thing some time right?